This misconception isn’t new. For as long as creativity has been applied to business, people have mistaken design — and creative work, more broadly — as some type of magic. Creative-types just sit down and will their ideas into being. Voilà, design. Of course, the opposite is true. Creative people have always had a process for their work. The same is true for experience design. UX design has come to prominence not only because of its importance to technology, but because there is a process designers can use to replicate results. Daily design reviews are a big part of our process. Each designer gets feedback on their current projects from the rest of the team. This brings multiple perspectives to every single project. The rest of this article will describe recurring themes in said design process, and then examine the specifics of our approach at DePalma. Why would we write this? Shouldn’t this be closely guarded information? First, the more people understand about how UX design works the better. Second, any method is only as good as its practitioner. No one said being a designer was easy. Or if they did, you shouldn’t listen to them. The UX design process follows a set of basic steps, but it’s also fluid. For example, you should always conduct user research in the early stages, but you’ll want to do more research as the design progresses to validate the design direction. No two design processes will be should be exactly the same, because each UX agency will have slightly different methods. Don’t think of the process as a regime to follow, but rather as a collection of techniques that help designers solve a unique problem. Creativity plays a central role in UX design, but the practice is fundamentally evidence-based. That means any design process worth a damn must involve a significant research component. Using research to inform the direction of the design is the only way to consistently deliver designs that truly solve the challenges facing the end-users. If your process doesn’t involve research, then you’re not really doing UX design. Some might call it user-centered, but our creative director is from Europe so we say human-centered. 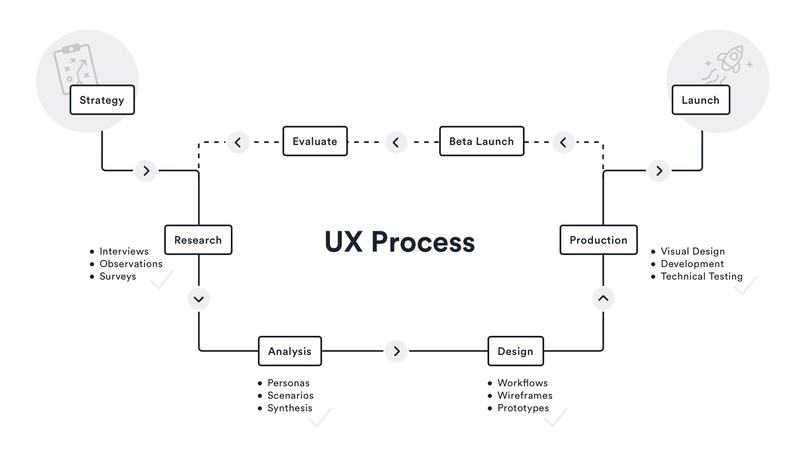 In either case, the UX design process is founded on the belief that users, the people who will actually use the finished product, should have a hand in shaping how the experience is designed. Practically, this means designers should engage users to understand their problems and build a sense of cognitive empathy for the end users’ experience. This is basically a modern way of walking in the other person’s shoes. The designers then harness the insight they’ve gathered to fashion an experience that’s personalized to the unique behavior of your audience. When the UX design is tailor-made for the a particular cohort of people, their engagement with the product — and the ROI for your organization — can be tremendous. If the goal of UX design is to create experiences that best solve the challenges facing a particular audience, then the design will need to evolve based on the feedback from those humans. As you’ll see in the next section, this feedback loop usually begins in the design phase with low fidelity wireframes and continues, well, for as long as you’d like to keep optimizing. Alright, so we’ve covered the theory. Now let’s look at the process in practice. I’m about to list all of the activities and outcomes in the UX design process. However, keep in mind that this process is flexible, and it can be adapted to fit the constraints of any new project. Before we do any designing, we work with you to define a vision for the project and establish the scope and the priorities. By working on the strategy first, we build greater alignment between our team and yours. Defining how you want this design to impact the bottom line for your organization is our primary objective at this stage. This is where a lot of agencies get it wrong. If a vendor moves straight to design, then they probably haven’t developed a strong understanding of your business, your users, or the state of your current design. As you can imagine, that’s important knowledge to have to inform the next steps in the process. If someone doesn’t understand these factors, how can they plan the right strategy, or even accurately quote the work? Our team interviews each of your stakeholders to gather information about the target audience, competition, and how each stakeholder defines success for the project. These interviews define constraints around budget and timeline, and may reveal important political dynamics that need to be honored throughout the project. For example, a business stakeholder may be particularly skeptical of the research process. In that case, we’ll need to communicate with them with extra care and detail as we uncover insights from our research. If your application is customer facing, we’ll analyze your closest competitors, define their strengths and weaknesses, and use them to identify where the needs of your market are underserved. When we’re designing a website or application, we need to catalog all of the content you’ve currently created, so we know what to include in the new experience design. Heuristics are akin to best practices in UX design. There are standards that almost every good design must abide by, and our designers review how well your application meets these criteria. This is just a first pass, but it helps us quickly identify areas of interest for later in the design. Once we have a strategy in place, it’s time to move on to the research phase. We use a mix of qualitative and quantitative research techniques to establish a rapport with end users about their needs, goals, challenges, and environment as it relates to your application. Qualitative methods are particularly important here, because they serve as generative research. This type of research helps our designers generate ideas for the experience design based on real-world insight rather than abstract assumptions. By combining what we learn from our research with the strategy we established in the previous step, we can design an experience that aligns with the needs of your users and has the desired impact for your business. This technique combines observational research with user interviews. Our team observes your end users where they normally use your application or perform the tasks you’re trying to optimize with an application. Then we gather their feedback about their current process and how they think it can improve. Surveys are a nice method for gathering feedback from a large population of users. We then analyze the responses for recurring themes, which helps us understand what shared goals or problems your audience has. Usually consisting of between 6 and 9 participants, focus groups are another method of ascertaining what users want from your new application. By including multiple people, focus groups can reveal certain organizational dynamics and spontaneous answers that might be lost in other methods. Even if we can’t do field research, we almost always try to interact with users through interviews. There’s no substitute for talking with someone one-on-one about Their needs, goals, and day-to-day challenges. Each and every answer could lead to a generative insight that significantly impacts the design. A mental model is a preconceived notion of how a piece of technology will work. For example, we all have mental models for how an iPhone will work. During the course of our research, we establish mental models with each cohort of end users so we can design experiences that mirror how they think the software should function. The sitemap is the skeleton that holds the entire experience design together. By organizing how users access the content throughout the application, we’re drawing a blueprint for how we’ll organize the designs we create later. Personas are representations of each type of your end users. Think of them as archetypes developed from first-hand research. They help our designers identify what matters most to each user type,incorporate that into the design and personalize the experience. To think through how each persona would use the software in their natural environment, our designers think through user scenarios. These short narratives explain how the new UX design will fit into the natural workflow of each user’s day. Use cases are the bare bones of user scenarios. They describe the series of steps every user needs to take in order to accomplish their goals. This includes things like inputting information to create a profile or manipulating data to create a report — except every single action is considered. Used in conjunction with personas, empathy maps helps designers parse through the range of experiences people have during their typical. This informs the design in specific ways, like how we lay out the information on the page, how large we make the font, and so on. Every piece of data gathered in the research process moves designers toward a more complete understanding of the end users. Empathy maps are perhaps the best visual example of how our designers are trying to immerse themselves in the day-to-day experiences of the people they’re designing for. The design phase is about translating our research into visual designs. These designs start out as low fidelity, black and white wireframes. This is the experience design in it’s roughest form, but it gives us an opportunity to get feedback from your stakeholders and users on the creative direction while it’s still easy (and inexpensive) to make changes. Once we get feedback on the wireframes, we’ll iterate, increase the detail of the design, and then return for more feedback. Then we’ll rinse and repeat until we arrive at a version of which all stakeholders approve. To understand how users interact with your product or website, we visualize the steps they take to complete a goal in the system. Journey mapping uncovers friction points and helps us optimize the process. Where research first meets design. Wireframes are the rough draft of the UX design, but they serve an important purpose. By creating the first visuals of the final design, we’re defining a starting point for the entire experience design. Testing usually happens after the design has reached the prototype stage. Once the design is mature enough to actually navigate, we’ll conduct testing with end users and stakeholders to get detailed feedback on certain parts of the user experience. 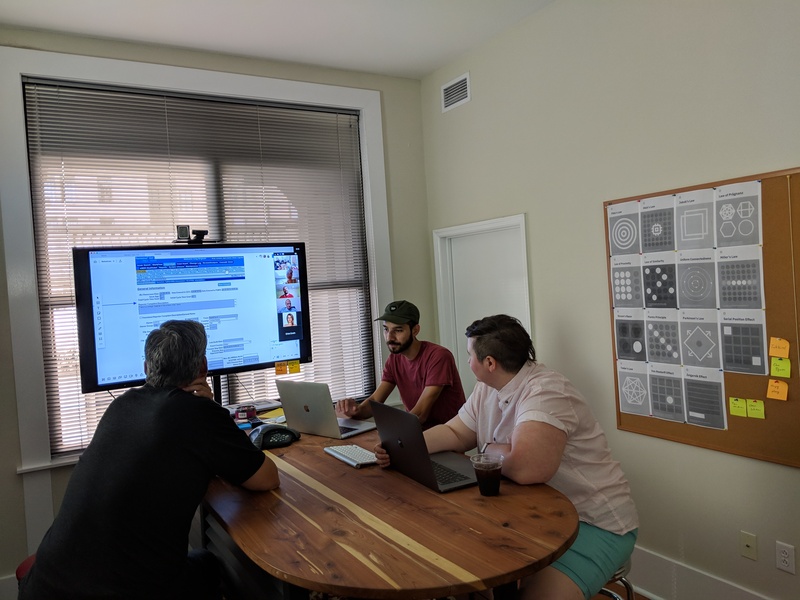 Usability testing with prototypes helps us validate that our design is an optimal solution for the end users before we start writing any code. This is a failsafe not only saves valuable time and resources, but also helps ensure the final iteration will be embraced by your audience. Like the name suggests, information architecture is the organization and structure of the content in your application. So when we design wireframes or prototypes, the information architecture is the hierarchy of content on the page and the sequence in which people move through the screens. After the iterations are complete and stakeholders, end users, and developers support the design, we’ll add the finishing touches. This means applying your brand standards (or helping you create new ones) and then passing the pixel perfect design to the development team — either your in house team or ours. Over the course of the UX design process, some of our clients decide it’s best to address their brand standards as well. Our term for the final steps in the design process. Once everyone agrees on the status of the clickable prototype, we’ll push the design across the finish line. If we’re developing your application ourselves or simply designing additional pieces of the product while your development team builds it, we’ll develop a sprint plan together for code releases. This involves the technical work of choosing a front-end framework, writing the code, and testing the quality the codebase once it’s written. Comes with a new shiny logo, font, color pallette, and other branding essentials. To better coordinate design and development resources, we utilize a sprint zero. During this planning period that allows design to hand off their work to development, and development can analyze the design work and plan their first release accordingly. During sprint zero, we break the work into ever-more specific tasks until each we reach the user story, which is the most detailed unit of work. A certain number of user stories are then planned for the first sprint and the first release schedule is set. Here we are. It’s time to launch the application to your beta testers or directly to the end users. But our work doesn’t stop there. We continue to perform usability testing to identify opportunities to improve the design and look for any bugs that need to be addressed. Even in this phase, it’s possible to take feedback from users and optimize the design further. In reality, UX design is constantly evolving, so there’s probably always a way to improve your design that bit more. We continue to test like we did in the earlier stages, but we’re now doing so with a larger cohort of users. Metrics like completion rate, task time, drop off rate, and conversions are all used to create a baseline of the app’s performance. If there are any bugs, we’re squash them without mercy. Sometimes the first engagement is only to build the most important features of the application. If you have other features in mind that you want to design, or just want to continue iterating on your current design, we can do that. As this post hopefully illustrated, UX design is not a product of pure creativity. It is an evidence-based, iterative process that relies on research to arrive at an optimal experience design for a specific audience. That's simple driver behind UX design's surging popularity: businesses are seeing results.